With small rosette like foliage Sedum spurium (rockcress) is as a creeping ground cover that forms a dense matt, tolerant of dry conditions and heat. With fleshy leaves, these succulents are a deciduous to semi deciduous plant depending on the climate and position. It thrives in poor soil and will even cover areas of building rubble as long as it has enough soil to take a hold. flowers are an extra bonus and they will cover the plant in summer. This is a fairly fast growing plant, and it forms a dense matt, it cab look great when used to underplant in a container of taller growing succulents. Pictured right we have Sedum spurium ‘Schorbuser Blut’ an old but very reliable red foliage form. Like most varieties it will reach a height of around 10cm. Best planted in full sun to light afternoon shade. The species is shade tolerant however in cooler areas it really needs sun to thrive. Excellent drainage is essential, moisture in the soil will quickly kill Sedum spurium. Look for a sandy or rocky soil, plant on a well drained sloping site or in a raised section of the garden. Drainage in contaoners can be improved by selecting a cactus and succulent potting mix. Use a liquid fertilizer in early spring as new growth commences and again in early summer. Sedum spurium ‘Tricolor’ is a variegated form. 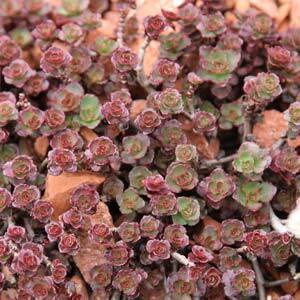 Sedum spurium ‘John Creech’ has bright green foliage with pink flowers, this one forms a very dense carpet. Although you can propagate from sed, we find that cuttings take root very easily, so propagation is simplest using this technique. Take a piece and push it into a propagating mix, best in late spring to early summer.